The father of one of the riders had words of caution for anyone thinking about navigating the same area. Three young men were forced to make a cold, wet hike through a bog that straddles the Monmouth-Leeds town line on Monday afternoon after their snowmobiles broke through a layer of ice there and got stuck in the frigid mix of mud, grass and water underneath. The men, who had been ice fishing on Lake Androscoggin, were returning along a three-mile stretch of bog when their snowmobiles went through the ice, according to Scott Kemp of Monmouth, whose 15-year-old son Max was in the group. The boys weren’t injured, but they did have to wade out through 400 yards of muddy water and slush, which was 3- and 4-feet deep in some places, said Kemp, who eventually picked them up in a side-by-side all-terrain vehicle. The other two riders were 15- and 22-years-old, Kemp said. Kemp spent a good part of Tuesday fishing the snowmobiles out of the bog, which required loading them into a flat-bottomed aluminum boat, then pulling them to solid ground using rope. The snowmobiles were not damaged. Kemp also had words of caution for anyone considering making a similar trip. Kemp, who lives just south of that area on Bog Road, went on to explain that the heavy snow had probably insulated the bog, preventing the ice from becoming too thick. On Tuesday, he said that he has lived there his whole life and doesn’t think that area will be safe for snowmobiling unless rain falls and turns all the snow into ice. He had several pieces of advice for snowmobilers, including that they should never travel across a bog by themselves or just because they see recent tracks. They should always have a way to contact somebody, Kemp said. Had he not been able to pick up the riders on Monday, he said, they would have had a long walk to somewhere warm and dry. That advice echoes some of what Cpl. John MacDonald, public information officer for the Maine Warden Service, and Bob Meyers, executive director of the Maine Snowmobile Association, said at a news conference announcing the start of Maine’s snowmobile season last week. MacDonald also said technology like cellphones and GPS has helped reduce the number of rescue operations in the last several years, but Meyers cautioned that cellphone reception can be spotty around Maine, so it’s best not to rely solely on smartphone GPS trackers. MacDonald did not immediately respond to a call Tuesday. 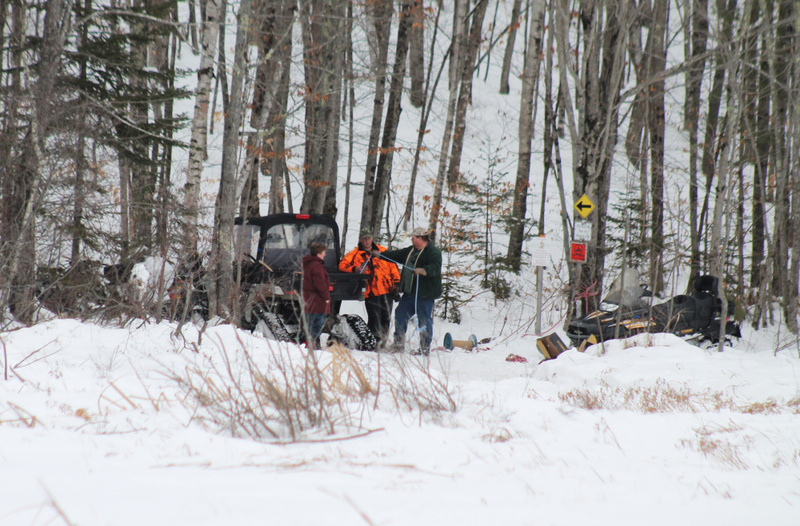 Game wardens responded to 182 reports of snowmobile-related incidents last season, which ran from Nov. 1, 2015, to April 10, 2016, including 12 search-and-rescue operations. There were 97 crashes, including 67 involving injury and five fatalities. Meyers said he expected 75,000 or so registered snowmobiles to be out this past weekend. He also suggested riders leave a note on the dashboard of their car or truck saying who they are, where they are going and what time they expect to return to give rescuers a better idea of where to look if they get lost.